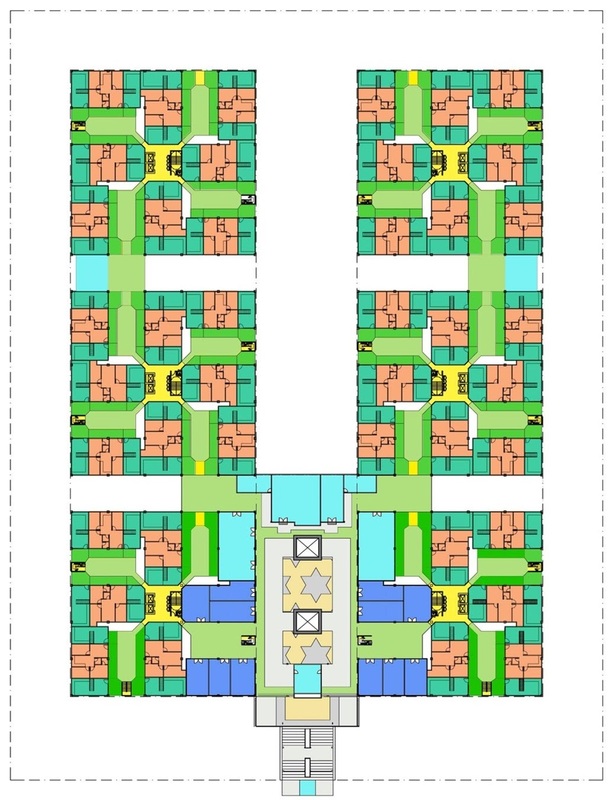 The medium-rise Honeycomb apartment with the checkerboard-plan can provide an answer to the problem of affordable housing in the main urban centres of Malaysia. Let me first introduce the concept. 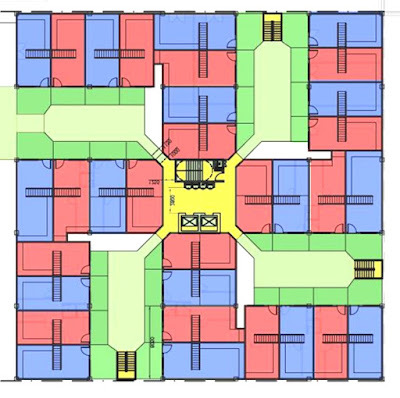 The basic checkerboard layout plan consists of eight duplex units arranged along a 3-storey high sky-court. 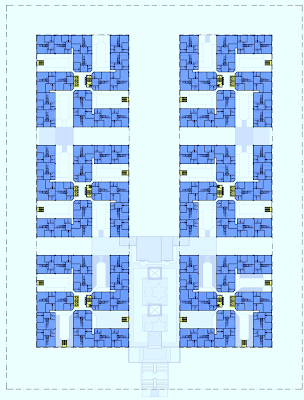 On each floor are four of these sky-courts that are linked by a lift lobby. This is the view of the 3-storey sky-court. 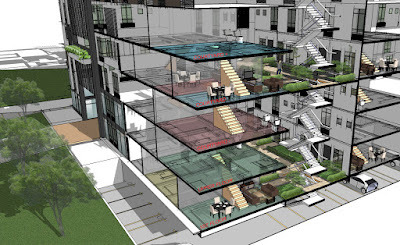 In this “Honeycomb Apartment” concept, every resident can step out of her main door to her front yard and beyond that, a landscaped courtyard – or “sky-court” with a garden fence off the edge. The doors lining the courtyard on the right are the front doors to the apartments. All apartments in this “neighbourhood in the sky” will have such doors, leading into a lofty three storey high sky-court which contains private and shared gardens. 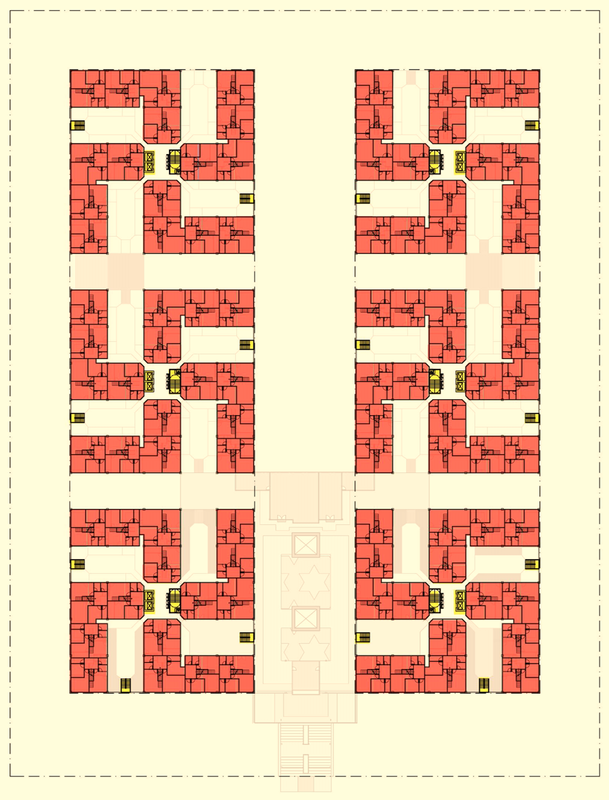 This is a look at the floor plans of a pair of apartments. As per the Honeycomb apartment arrangement, units on the courtyard garden level either have stairs going down to bedrooms on the floor below, or have stairs going up to bedrooms on the floor above. 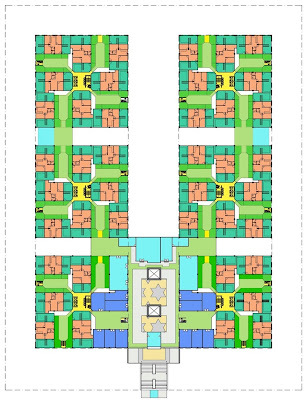 The typical apartment is a duplex unit with living room, dining and kitchen on the courtyard level and three bedrooms, two bathrooms, a utility space and a dry yard on the upper level or the level below. Residents here enjoy the benefits of a Honeycomb neighbourhood. They share a communal courtyard with small number of other households, making it easy for neighbours to get to know and interact each other. There is sufficient space and light to garden just outside their home. With many “eyes” overlooking the sky-court along with safety measures such as a garden fence at the edge of the sky-court and child barriers at strategic locations, the sky-court can be made safe for children. Children can play just outside in the courtyard, making this apartment more suitable for families. 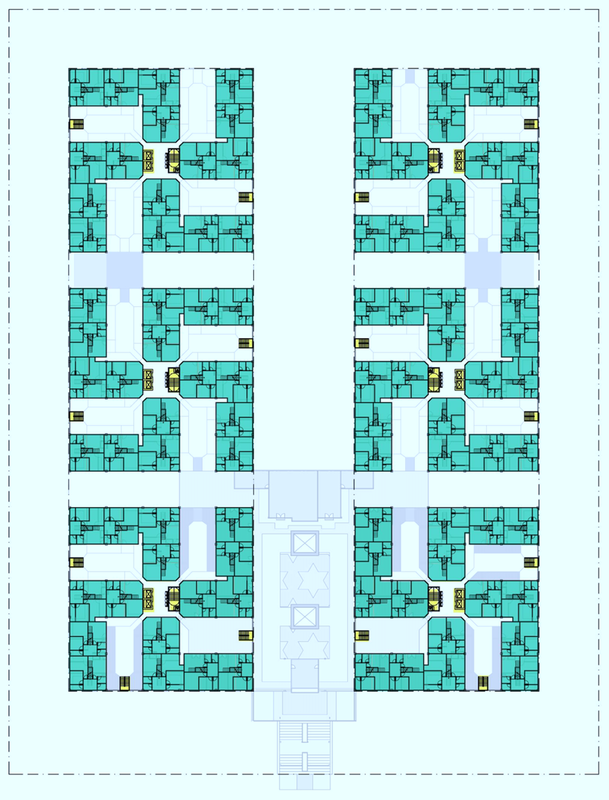 Eight apartments front the typical courtyard, about 8 x 16 metres on plan and 9 metres high. They each have a front-yard 4m wide and 2.4m deep where residents can tend their own garden. It also provides a buffer between bypassing residents and the front door, providing a measure of privacy to the living room and still allowing people inside a view of the sky-court. By securing the edge with an anti-climb fence and securing access to the lift lobby and escape staircases, the courtyard is suitable for smaller children to play with their parents and neighbours looking on. At the ground level, the entrance is connected to the public street by stairs that go up a sloped garden that screens the car park behind it. Off the entrance are two courtyards opposite each other which have shops; they each lead to the two wings of the apartment block. 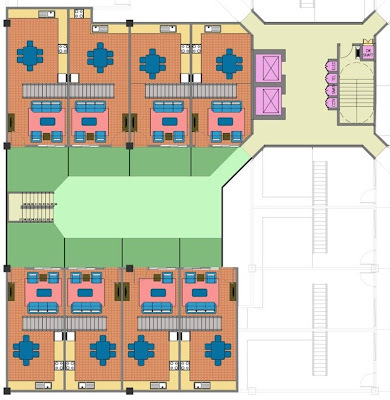 In the middle is a community centre with Surau, multi-purpose hall and kindergarten. 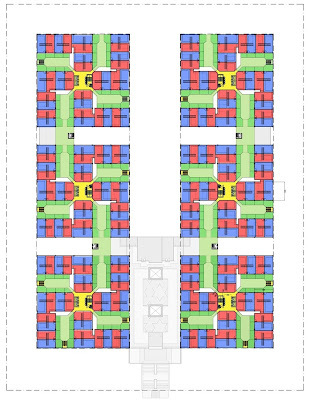 The high density of 130 units per acre is achieved by the 12-storey version of the checkerboard plan which has a basement car park where the parking standard is 2.2 car parks per apartment, or with just the ground floor car park where the requirement is 1.1 car park per apartment. Unlike conventional high-rise apartments which have similar densities, here the housing blocks are not divorced from the street level, separated by multiple levels of car parks. The ground floor car park can be easily screened-off from the front by a garden that slopes up to the first floor and from the sides and rear by walls and rows of trees. The bulky mass of blocks is also easily broken up by the sky-courts and façade treatment which introduce strong vertical elements that counter the horizontality of the floors. 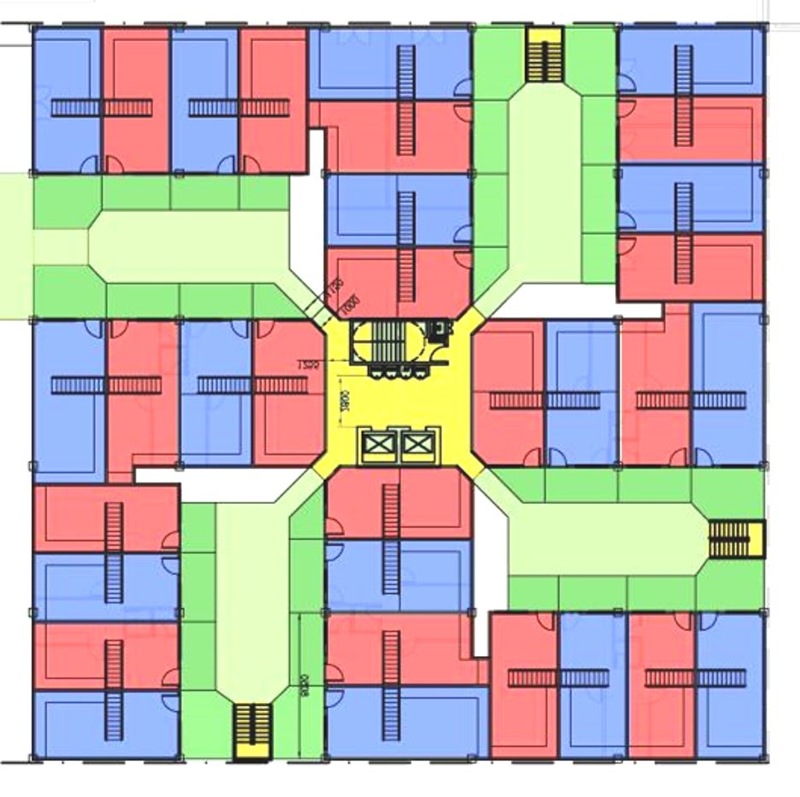 Adopting duplex floor plans also avoids the monotonous repetition of window patterns on the elevation. 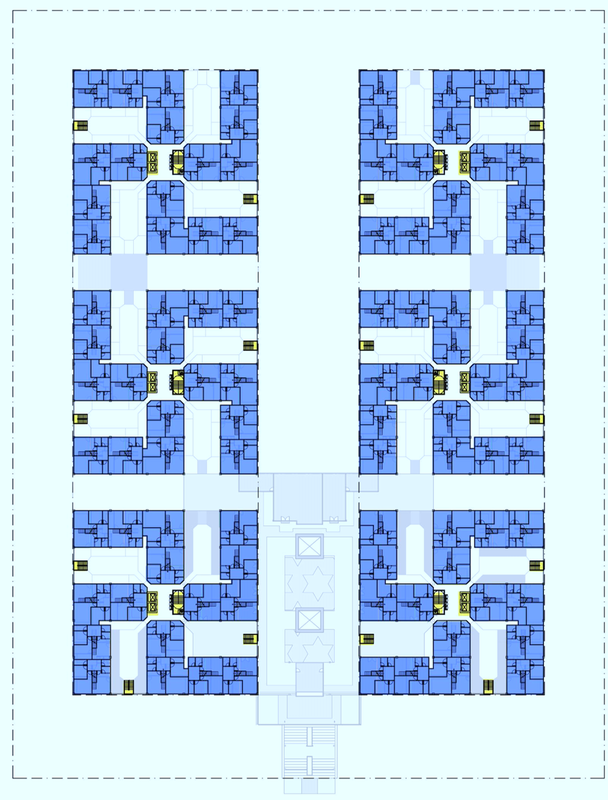 Corridors have been eliminated and substituted instead by sky-courts. However, to solve the real-world problem of providing housing in Malaysia’s major urban centres, more cuts need to be made. 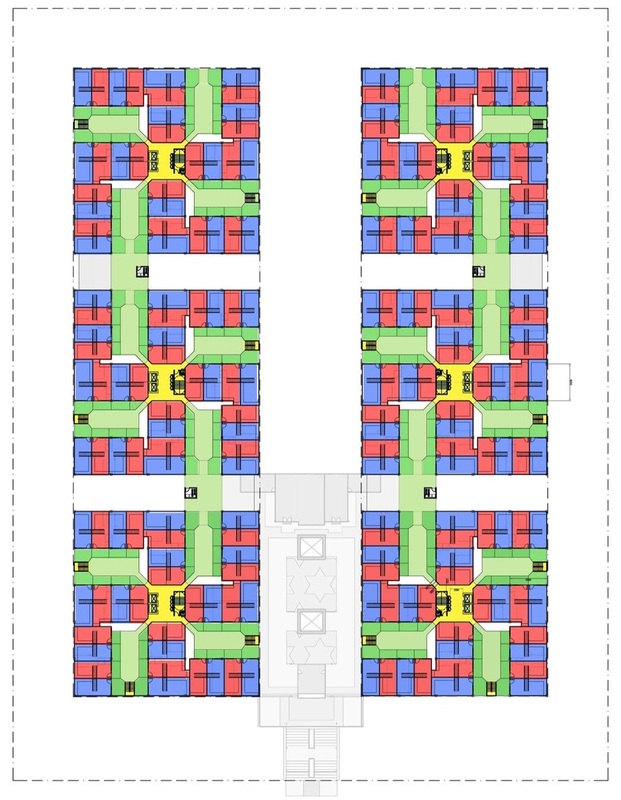 How the checkerboard-plan can make high densities acceptable, maximize site coverage to fit in more units on medium-rise buildings and provide sufficient car parks efficiently will be discussed in the next post.